This is an album I've wanted ever since it came out last holiday season. I finally managed to snag a copy at the local Best Buy's grand opening sale, and let me just say it was more than worth the wait. 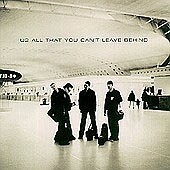 Many critics hail this as U2's greatest masterpiece since The Joshua Tree. I can't say that i can argue. After their last CD, Pop, received mixed reviews and, by many, was considered even a flop, U2 has returned more to their roots and delivered a truly great album. Utilizing their unique style of emotionally driven rock, U2 is able to cover a wide spectrum ranging from the very upbeat "Beautiful Day" to the more deep and moody sounding "New York". Still, though, while no two songs are identical, the entire package fits perfectly together as an album. Fueled by the passionate vocals of Paul Hewson (more commonly known as "Bono" (and for those of you out there who still don't know, its pronounced "baw-no" rather than "bo-no" (unlike that guy who hit a tree skiing...)), along with the backing vocals, guitar work, and keyboards of Dave Evans (better known as "The Edge"), Adam Clayton on bass, and Larry Mullen on drums. U2 retains all their original members and still sound stronger than ever. All components - instrumentation, lyrics, vocals, and production - all come together perfectly in every song. The songs on this album range from (for lack of a better word) typical classic rock ("Wild Honey") to more synth fueled alternative Depeche Mode-esque sounds ("Elevation"). Still though, all of it is U2, and all of it sounds great. If you're a fan of U2, or if you've never even heard of U2, if you're a fan of rock of any type, or just good, non-corny, emotional, passionate, real music - you should give this CD a try.